Clenz u Cotton Buds are soft and gentle on your ears. Made from 100% natural, organic cotton and free from Chlorine, these are absolutely safe to use. 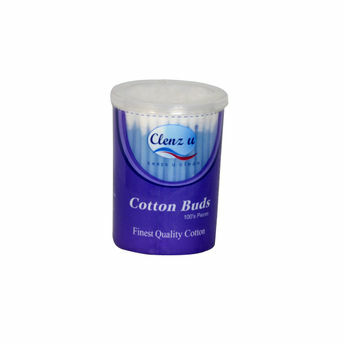 Clenz u Cotton buds feature flexible plastic sticks and are naturally soft and absorbent. Ideal for cosmetic, personal and baby care. Explore the entire range of Cotton Buds and Balls available on Nykaa. Shop more Clenz u products here. Explore the entire range of Cotton Buds and Balls available on Nykaa. Shop more Clenz u products here.You can browse through the complete world of Clenz u Cotton Buds and Balls .Alternatively, you can also find many more products from the Clenz u Cotton Buds range.